Cosmic Science believes that even a small particle of the earth has the capability of absorbing the energy from the cosmos. When it comes to the gemstones our astrologers and scholar have researched that these gemstones obtain immense divine energies emitted by the different planets and cosmos available in the universe. And liberate these energies in the aura of a human being to bring several positive changes in their lives of its wearer. Gemstones have been used since ancient ages for their useful healing properties that help in diagnosing the several physical and mental health-related issues. By healing properties, we mean that ability of a gemstone to diagnose the stress, mental disorder, and gloominess. There are different gemstones which people enthusiastically wear as their lucky charm. Similarly, many people wear cat’s eye gemstone for its useful healing properties also as their lucky charm. Now, the question which emerges in the mind of rationalists that makes wearing cat’s gemstone really proves lucky or fortunate for its wearer? Or it is just a misconception prevails among the gem believers. 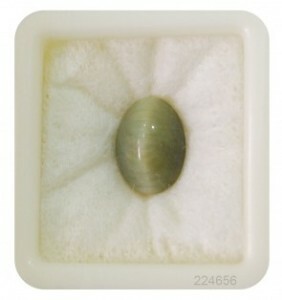 Cat’s eye stone is known to represent the cosmic powers of the planet Ketu on the earth. Ketu is a ferocious planet which signifies quick wealth, health, prosperity, spirituality, luck, mental health, and greed. It is popularly about the planet Ketu that while it exists in the positive houses of your horoscope will lead you to taste success at every front of the life be it personal, professional front. Moreover, according to Indian astrology, the planet does not have any physical representation of the universe. But due to its boundless capability of carrying enormous positive results will compel astrologer to cast it in the group of all astrological planets. Cats eye gemstone is unique appearing stone because of a strike of light that passes exactly from the center of the stone. The stone is termed being lucky or fortunate after contemplating its positive impacts on the lives of its wearer. Therefore, a person who believes in astronomy and powers of gemstones should rest assured that cat’s eye gemstone really works and acts in the favor of its wearer. But with only one condition implies that its respective planet Ketu must available in the positive or benevolent houses of the horoscope. On the other hand, if Ketu is placed in the wrong houses will lead its wearer to a series of miserable events. Consequently, Cat’s eye gemstones really work prove lucky for its wearer, but only if Ketu placed in positive houses. Thus, one must consult an astrologer before wearing this vengeful gemstone. Difference Between Natural And Heated Cat's Eye Gemstone?